I was at a doctor's appt this week with my husband, when I grabbed a copy of South Florida Parenting Magazine on our way out the door. 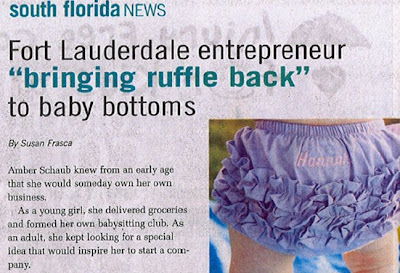 After being interviewed by a reporter a few months back, I knew they planned to include an article about RuffleButts in an upcoming issue...I just didn't know it was in December's issue! My husband was flipping through the magazine as I was driving, and had this adorable excitement to his voice as he held up the page decorated with two little ruffled baby bottoms! It is always so fun to see your work coming to life, but I have to admit that it was double the fun to have my husband proud of me too!! I'm sure that all moms and entrepreneurs can relate to me here, but it is these small celebrations that keep me on track towards my dream. Please visit our website to read more about this article and other recent press.